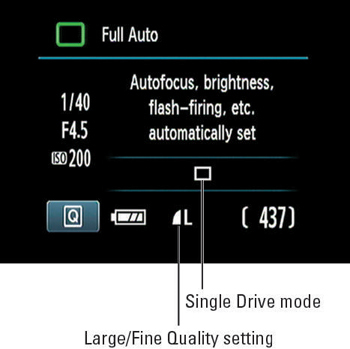 Full Auto: The name of this mode, labeled in the following figure, indicates that the camera takes full control over all exposure, brightness, flash, color, and other settings. In essence, the Canon Rebel 1100D turns into a very high-quality point and shoot camera. Full Auto is a fantastic mode to start out with. You can take great photos most of the time and can discover how to operate the camera at your own pace. These two modes are identical, except one disables flash. Flash Off: Also labeled in the figure, this mode does the exact same thing as Full Auto, except flash is disabled. This mode provides an easy way to ensure that you don’t break the rules when shooting in locations that don’t permit flash. 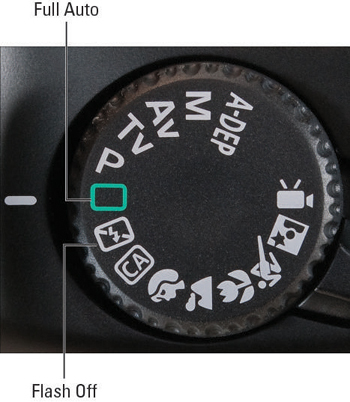 Set the focusing switch on the lens to the AF (autofocus) position, as shown in the following figure. The figure features the 18–55mm kit lens. 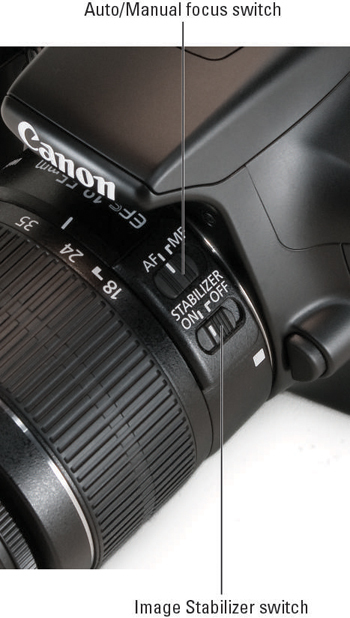 If you own a different lens, the switch may look and operate differently; check your lens manual for details. Unless you’re using a tripod, set the Stabilizer switch to the On setting, as shown in the preceding figure. The switch controls image stabilization, which helps produce sharper images by compensating for camera movement that can occur when you handhold the camera. If you’re using a tripod, you can save some battery power by turning off stabilization. Again, if you use a lens other than the kit lens, check your lens manual for details about using its stabilization feature, if provided. Check the Drive mode on the Shooting Settings display. By default, the camera sets the Drive mode to Single, which means that you capture one picture with each press of the shutter button. But you can choose the 10-second or continuous self-timer options if you prefer. You can view the current Drive mode in the Shooting Settings display, as shown in the following figure. To adjust the Drive mode, press the left cross key. 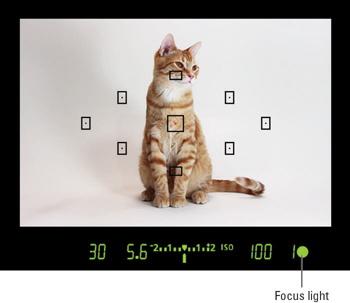 The screen also briefly displays three exposure settings (f-stop, shutter speed, and ISO), as shown in the preceding figure. Select the Quality setting via Shooting Menu 1. Looking through the viewfinder, frame the image so that your subject appears under an autofocus point. 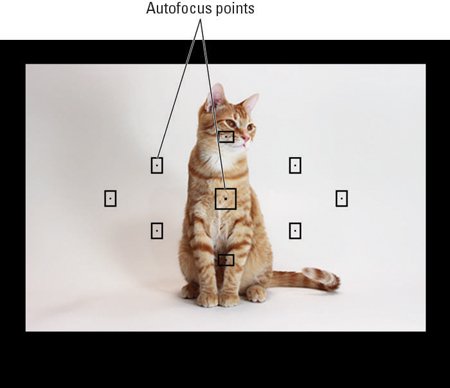 The autofocus points are those nine tiny rectangles clustered in the center of the viewfinder, as shown in the following figure. Framing your subject so that it falls under the center autofocus point typically produces the fastest and most accurate autofocusing. Pause to give the camera time to set focus. This step is critical! If you simply press the shutter button down in one continuous motion, the camera may not be able to set focus correctly. When the camera establishes focus, one or more of the autofocus points blink red to indicate which areas of the frame are in focus. When you photograph stationary subjects, the green focus indicator lights when the camera locks focus. In most cases, you also hear a tiny beep, and the focus indicator in the viewfinder lights, as shown in the preceding figure. Focus is now locked as long as you keep the shutter button halfway down. Typically, the camera focuses on the closest object; if you want to set focus elsewhere, your easiest option is to use manual focusing. While the camera sends the image data to the camera memory card, the memory card access lamp on the lower-right corner of the camera back lights. Don’t turn off the camera or remove the memory card while the lamp is lit, or you may damage both camera and card. When the recording process is finished, the picture appears briefly on the camera monitor. By default, the review period is two seconds; you can adjust the timing via Shooting Menu 1.